As an Indie Author, you can get a little nervous when another author and respected professional offers to read and review your most recent work. When Marion offered, I took a deep breath and nodded, not knowing what might be the result. Her recent review allowed me to exhale. Thank you Marion. Have you often wondered how the stories in the Bible relate to today's world? I, for one, have done that many times. Many times I've tried to draw parallel lines between today and yesterday. Sometimes it works and sometimes it doesn't. But within the pages of this book Addi ben Zuriel, the central character, brings new understanding to an old story. In the Bible Jesus tells this young man, Addi, that in order to find eternal life he (Addi) should sell all of his possessions and follow the Lord. Of course Addi is skeptical since it is he, along with an elite band of Pharisees, who are seemingly preparing for a great leader in the guise of their Messiah to arise and with a vast army break the people free from the chains of Rome's rule. What follows is the story of how Addi comes to accept Jesus as the Messiah; it also takes Addi quite some time to reailze that the 'new world order' is not to be of this world but a kingdom of the heart. Through the perils and intrigues of a Biblical Jerusalem at Passover, we follow Addi as he in turn follows Jesus through the Passover and ultimately through the crucifixion. We become friends with the disciples and with Jesus's mother Mary. Like another reviewer, I too wish the Bible could be retold in a manner similar to this book. It is easy to read and understand. For me, it was also easy to see the amount of research that has gone into this tome. And while it can easily be read in a day or two I took several weeks to finish it, allowing myself the time to absorb the personal meanings. It is a book rich in detail yet easily understood. The Marion Marchetto, published author of two books and the creator of the website Vintage Story Telling in a Modern World recently posted an Author Interview with Richard A Hackett Jr. The interview is a in-depth look at the author, the novels he has written, focusing mostly his recently released novel Everything - The untold story of the rich young ruler. Her website is a great resource for readers and authors alike. Click on the link to read the full interview. Sea Mercy in the News! Fijian Prime MinisterVoreqe Bainimarama Announces Sea Mercy program for the remote islands of Fiji during official launch ceremony in Suva, Fiji! 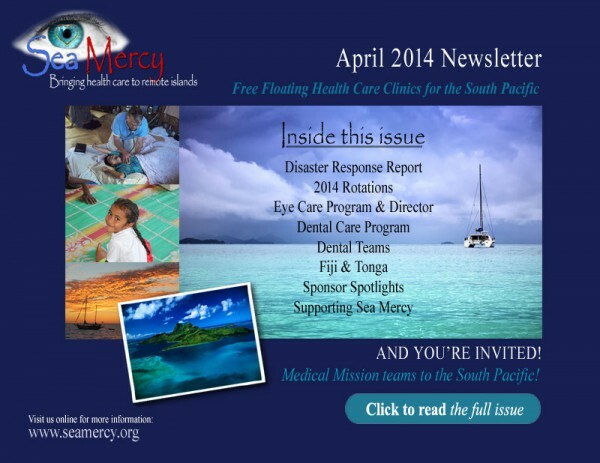 Sea Mercy, a US based 501(c)3 non-profit organization is one of my passions and where "the eyes of my heart" are focused (after God and family). The link at the bottom will take you to our most recent newsletters. We operate from April until the end of October, bringing free health care (dental, eye and medical) to most remote islands of our island nation partners (Tonga and Fiji). If you are a health care professional (doctor, dentist, ophthalmologist, nurse, pharmacist, physician assistant, dental assistant or hygienist), I hope you will consider joining us on one our our 2 week rotations (spouses and friends are welcome to join you). It will be the best working vacation you will every experience. 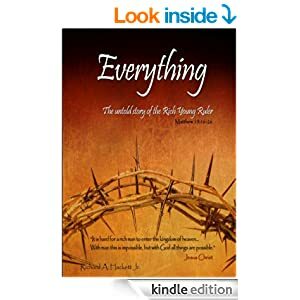 My most recent novel, "Everything - The untold story of the rich young ruler" is based on the gospel encounter in Matthew 19:16-26. The Apostle John stated at the end of his gospel if every one of Jesus’ acts and encounters were to be written down, the whole world would not have room for the books that would need to be written. What is even more difficult to grasp is the idea each of those acts and individual encounters with the Son of God had an even deeper story and history leading up to, and following, that brief meeting. A story and history we will never know fully until we see Jesus. This book tells the story of one of those hundreds of encounters we read about in the four Gospels. It is the story of the Rich Young Ruler and the journey that led him to ask Jesus what would ultimately end up being the most important and revealing question of his life. What must I do to inherit eternal life? In looking at the young man before him, the creator of the universe knew there was far more going on behind, within, and around this influential and wealthy young man than the simple question he had asked Jesus. There always is. In the same all knowing way, Jesus’ response had far more meaning behind it than the young man could have ever imagined, or perhaps wanted to hear. 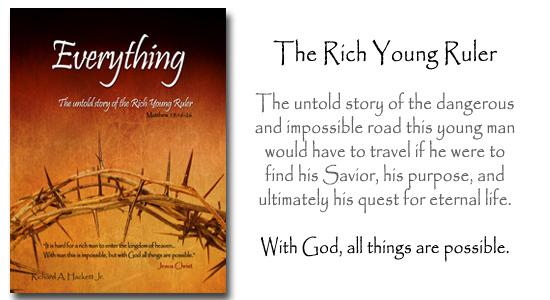 At the end of his encounter with Jesus, we read the rich young man went away sad, because he was asked to give up everything if he were to follow Jesus. Jesus goes on to explain to his disciples how hard it is for the rich to enter the kingdom of God. Afterward their only response was, "Who then can be saved?" Jesus' replied; "With man, this is impossible, but with God all things are possible." For many, that is where the story of the rich young ruler ends. However, there is a strange verse in Mark 14:51, about a "young man" who was following Jesus in the Garden of Gethsemane, as Jesus was led away after his arrest. The verse does not seem to belong or have a purpose behind it, but God always has a reason for everything. This novel is not about the ending of this young man's life after his initial encounter with Jesus, but about the beginning of it. It is the untold story of the dangerous and impossible road he would have to travel if he were to find his Savior, his purpose, and ultimately his quest for eternal life. With God, all things are possible. 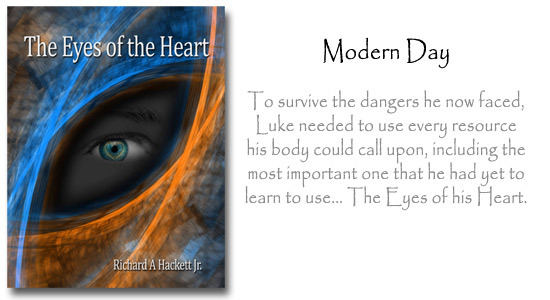 My novel "The Eyes of the Heart" is probably my most controversial book. Set in the modern day, it incorporates a great deal of spiritual and biblical doctrines in order to tell the story. It was one of my most challenging stories to write, but also one that I had the most satisfaction from. From the time he took the job with Allen Brooke Inc., Luke’s life had gone from one incredible challenge to the next. In the blink of an eye they transitioned him from writing training manuals for a new game, to putting his very life on the line for the company. He was quickly realizing that the product was no game at all, and that it had far more uses and dangers for society than he could have ever imagined. And he was clearly not alone in that understanding. Secret societies and government intelligence agencies were now looking intently into it, and into anyone who was involved with it. His professional and personal life was suddenly thrust into a deadly battle between two political and religious ideologies that he didn't understand but he needed to grasp if he had any chance to stop the religious genocide that one of them had planned. He would need to use every resource his body could call upon, including the most important one that he had yet to learn how to use… The Eyes of his Heart. 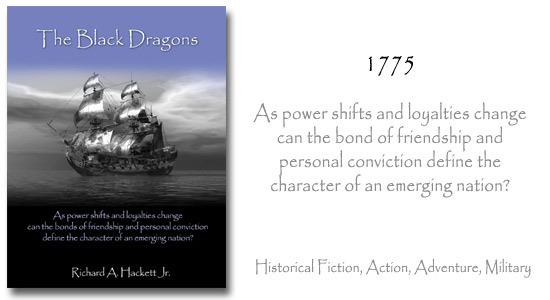 The Black Dragons (historical fiction, action/adventure) is a great action and adventure novel that I wrote for my son after sailing in the Caribbean. Growing up on a tobacco plantation should be a simple life, predictable as the changing seasons, but when unlikely friends become entangled in the politics and shifting loyalties of nations, life is anything but simple. What starts as a plan to protect the families living on one small plantation, captures the attention of world powers vying for control of the American Colonies and the Islands of the Caribbean. With few options available, untried heroes find themselves caught in a deadly struggle to protect their ideals, their freedoms and their lives. At every turn their friendship and loyalty to each other and to those brave men they come to lead, is tested. Can the innocent companionship of childhood stand in the face of hatred, prejudice, and war between world powers? Will the ideals that they embody become a testimony to a new world vision for an emerging nation?